Nat. Pflanzenfam., ed. 2 [Engler & Prantl] 18a: 416 1930. 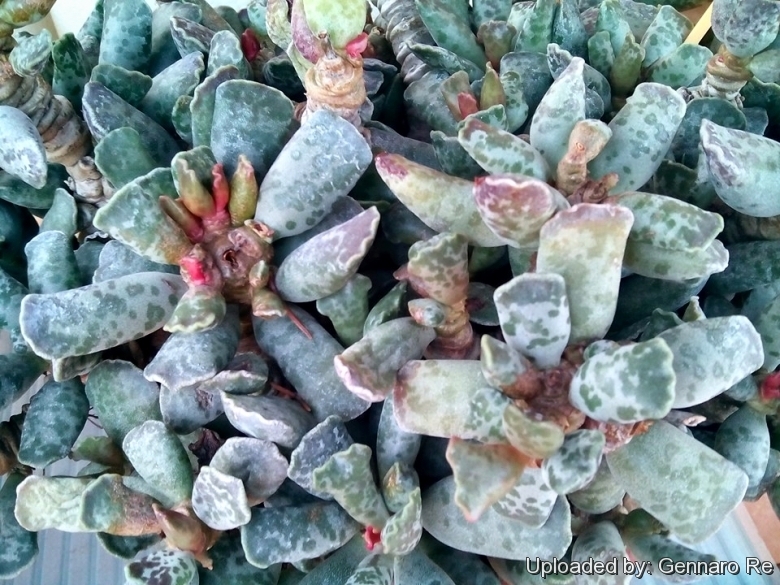 Origin and Habitat: Soutvlei, north of Grahamstown in the Zuur Mountains, Eastern Cape, South Africa..
Habitat: This Adromischus is a typical component of the Eastern Cape succulent Thickets. Adromischus cuneatus Poelln. non Thunb. 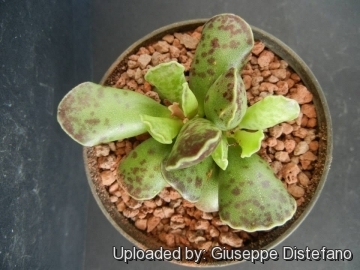 Cotyledon cooperi var. immaculata Schönland & Baker f.
Description: Adromischus cooperi (Club-adromischus) is a dwarf freely branching perennial succulent 2-7 cm tall and 15 cm in spread. 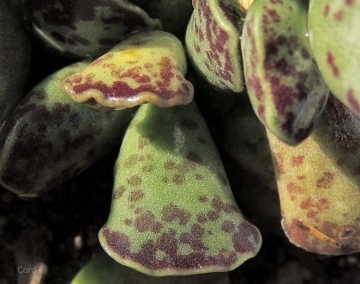 It has larger leaves than Adromischus cristatus, plump, narrowed toward the base, pale silver-grey with a hint of duck-egg green and elegantly spotted with rich dark purple. Stems: Short, spreading, greyish-brown occasionally with aerial roots. Leaves: Decussate, tubular-shaped to inversely lance-shaped terminal part ovate triangular wider than the leaf with a white, slightly wavy horny leaf margins, 2.5-5 cm long, glossy, grey-green to blue, hairless, distinctly mottled on the upper surface with large purple markings. Inflorescences: 35 cm or more long. 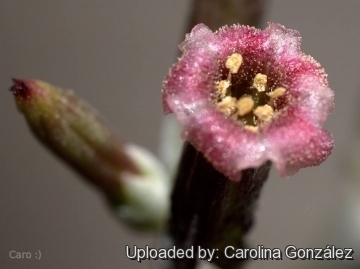 Flowers: Tubular, green-and-red covered in a thick bloom with white-margined, pink or purple lobes and club-shaped hairs in throat and on corolla-lobes. Fruit: Fruit a dry many seeded follicle. Remarks: Adromischus cooperi and the related Adromischus festivus are so much confused that a considerable amount of Journal space was given up to discussions about them. Adromischus festivus C.A.Sm. : leaves small semi cylindrical, more or less mottled with red. Juvenile leaves can be broad with a long margin. Distribution: Noorsveld, Eastern Cape. Cultivation and Propagation: They prefer well-drained soil in a partially shaded position and require a minimum temperature 5°C (But hardy down to -7°C for short periods), with good drainage and dryness in winter to resist the cold. Let the soil dry between soaking, in the wild, it receives rain mostly in spring and fall. Must have very dry atmosphere. They are vulnerable to mealybugs and rarely scale. It is prone to rotting from the tuberous base or from dried inflorescences. As the plant matures, the centre becomes bare. When it does, restart it from side cuttings and throw away the central part. Propagation: Usually propagate from single leaves (leaf cuttings) or stem cuttings seed propagation is rarely used. Twist off a leaf and permit it to dry out a couple of days, lay it on the soil and insert the stem end partially into the soil. The original leaf should not be removed until it has dried up. Try to keep the leaf somewhat upright so that the roots are able to grow downward. If grown in a container, bottom watering by immersing the container is recommended.